Commonly known as Sheng Jian Bao, this is a traditional Shanghainese dim sum. Shanghai Fried Pork Buns are pan-fried crisp on the outside with a steamed soft layer just beneath. Inside, the minced vegetable and meat are surrounded by juicy broth. Frying / Steaming: Heat a small amount of oil in the frying pan. Space buns evenly in the pan, leaving room for the buns to expand slightly. When buns turn golden brown on the bottom, add water to half the height of the buns. Cover frying plan and continue cooking at medium temperature until water has been absorbed by buns. Serve with ginger vinegar, condiment of your choice, or on its own. This is the traditional Shanghainese dim sum Sheng Jian Bao with a twist. Shanghai Fried Curry Beef Buns are pan-fried crisp on the outside with a steamed soft layer just beneath. Inside, the minced curry beef and vegetables are surrounded by juicy broth. Serve with condiment of your choice, or on its own. Commonly known as Xiao Long Bao, this is a staple menu item when dining Shanghainese. Shanghai Juicy Pork Buns are pork dumplings filled with hot soup broth. The buns have a skin that's delicately thin yet resilient enough to encase its steaming, soupy contents. Steaming: Steam buns for 10-12 minutes then serve. To prevent buns from sticking to steamer, apply a small amount of oil to steamer or place buns on green vegetable leaves in steamer. Boiling: Cook buns in boiling water for 10-12 minutes. Then add a cup of cold water and continue boiling. When buns float to surface, they are ready to serve. Serve with ginger vinegar, condiment of your choice, or on its own. Please note that the soup inside is extremely hot so either wait until they cool down to enjoy - or you can bite the top off, sip the soup, and then eat the dumpling. This is an alternate version of the traditional Shanghai Juicy Pork Buns (Xiao Long Bao), with the addition of crab meat in its stuffing. Shanghai Crab Meat Pork Buns are crab meat & pork dumplings filled with hot soup broth. The buns have a skin that's delicately thin yet resilient enough to encase its steaming, soupy contents. Frying: Add 3 teaspoons of oil and put buns into a medium heated frying pan for 1-2 minutes. Add a cup of water all around the buns. Cover frying pan and cook for 10-12 minutes or when the water in the frying pan dries up. Commonly known as Shui Jiao, these are soup dumplings filled with pork, mushrooms, and cabbage. Boiling: Cook dumplings in boiling water for 10-12 minutes. Then add a cup of cold water and continue until the water comes to a boil again. Dumplings are ready to be served. Steaming: Steam dumplings for 10-12 minutes then serve. To prevent dumplings from sticking to steamer, apply a small amount of oil to steamer or place dumplings on green vegetable leaves in steamer. 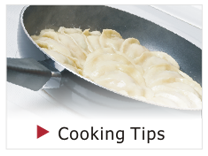 Frying: Add 3 teaspoons of oil and put dumplings into a medium heated frying pan for 1-2 minutes. When the bottom of dumplings turn golden brown, add a cup of water all around the dumplings. Cover frying pan and cook for 10-12 minutes or when the water in the frying pan dries up. Dumplings are ready to be served. Serve with vinegar, condiment of your choice, or on its own. Commonly known as Shui Jiao, these are dumplings filled with pork and vegetables. Commonly known as Shui Jiao, these are dumplings filled with pork and chives. These Shanghainese style wontons are filled with pak choi and meat goodness. Boiling: Add wontons into boiling water. Switch to medium heat, and wait for wontons to float. Add a small amount of cold water, and wait until the water reboils. Drain the water and serve. Total preparation time is about 8 minutes. These Shanghainese style wontons are filled with spinach and meat goodness. Shanghai Fried Beef Buns are pan-fried crisp on the outside with a steamed soft layer just beneath. Inside, the minced beef and vegetables are surrounded by juicy broth. Asia Pacific Group takes no responsibility for any typographical errors on our website.